The classic Giro di Lombardia, also known as la classica delle foglie morte (the classic of the fallen leaves), takes place on the 15th of October. This is one of the five "monuments" in cycling, well deserved if I may add. I wrote on twitter some time ago that I have mixed emotions regarding this race. For one, it is the most beautiful one-day race in the entire calendar. Secondly, it marks the end of the cycling season. That duality gives me mixed emotions. Photo by RCS - downloaded on their site. The race origins back to 1905, then by the name Milan-Milan, but got it's original name already in 1907. 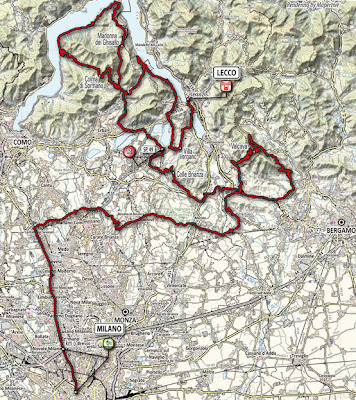 The route has been known to change several times, strangely enough without the big commotion like they had in Belgium this year when the Flanders route changed. One very famous climb to most cyclists is the Madonna del Ghisallo. Being named the patronnes of cyclists by priest Vigano, later approved by Pope Pius the XII, the Madonna de Ghisallo today contains a museum (an old chapel from 1632) of different cycling artefacts. The museum is well worth a visit, and you can also pay your respect to the cyclists that have died by the eternal flame that burns there. Downloaded on the Lombardia homepage. It's hard to point out exactly why I feel this is the most beautiful one-day race. It could be the fantastic scenery with the hills surrounding lake Como, the magnificent three-four climbs always in the race, or the all-or-nothing mentality we find in the classics. Despite the expectation one could have that the riders are worn out after a long and tiresome season, the Lombardia always seem to deliver the goods, always plenty of fine racing. After all, true champions never let an opportunity to win go away easy. Regardless of taste, you can find anything in Northern Italy. Shopping in Milano, hiking in the Dolomites or if you're interested in politics, you probably know about Lega Nord, the separatist party. If not, try to remember the finish line, haven't you noticed the 'cannabis flags'? Anyway, this post is not about that, it is about Lombardia and wine. If prosecco is the Italian cousin of champagne, how will you describe franciacorta? I will definitely name it as the Italian brother to champagne. It is much older, wiser drink than prosecco, more refined if you like. The reason for this is that the producers of franciacorta use the very same technique as the producers of champagne; a second fermentation while bottled. The wine taste of peach, honey and orange flower. The grapes, normally chardonnay and pinot nero, will be handpicked by the end of August. The Italians claim that the reason their product is so good is due to the unique soil, warm climate and the cool, moist breeze from the Alps that caress the grapes, giving them perfect content of sugar while holding the level of sourness down. Despite the fact that franciacorta, unlike its French brother, is just some 50 years old, the future is looking bright. The most beautiful one-day race of the season is almost here, giving you plenty of time to walk to the nearest wine shop and buy a nice bottle of franciacorta, to enjoy while the 25 teams and riders of the peloton determines the hero of the day. Assos Zegho - eye candy or simply dandy?